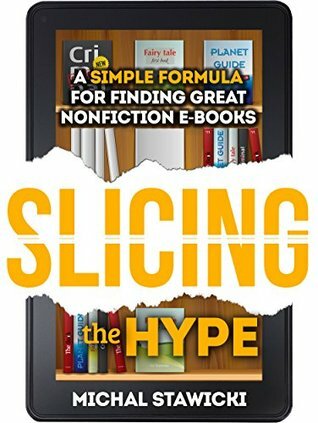 I received an email asking me if I would be interested in reviewing this book. Knowing Sarah I jumped at the opportunity without even asking any questions. Once I got the book I realized it was an anthology of sorts. 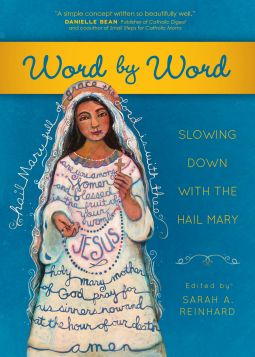 This amazing books takes the prayer of the Hail Mary and breaks it down word by word. I must say it was an amazing journey and one I plan on taking again. I know I will reread this book likely a number of times! The contributions are an amazing mix, from clergy, laity, men and women, married, single with and without children. As I was reading numerous times I took quotes and emailed them to friends thinking how perfect the quote would be for a person at that point in time. I highlighted almost 50 passages during my first read through and will use some of those in the rest of this review to highlight how excellent this book really is. Sarah in the introduction states: "You might say it's become my blankie prayer. 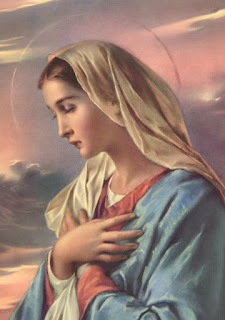 Just as my children cling to their worn-soft, faded blankies, so I cling to my Blessed Mother's skirt through this prayer. When my heart aches, I cry out a Hail Mary. When I need to be held in my sorrow, it's a Hail Mary that comes out. When I'm worried or troubled, the words I can't find on my own shape up as a Hail Mary." This echoes with me so much. She goes on to say "I pray it unconsciously, the way my children grab my hand without even knowing it when we're walking side by side. It's a comfort to me, and I'm so blessed to have it. When I don't have words for the desires of my heart, I always have the Hail Mary. When I'm lonely or sad or just at odds with the world, I have the Hail Mary. In the Hail Mary, I find so very many spiritual delights, not the least of which is how it leads me, irrevocably, closer to Mary's Son." I find that I am the same way, it is my default prayer, my first in the morning and my last at night. Next Sarah exclaims: "Of course, I couldn't resist considering my favorite prayer in light of this word-by-word approach. What would it be like to pray the Hail Mary deliberately, carefully weighing the importance and significance of every one of the forty-two words?" I have found from the time I have read the introduction to this book my prayers especially The Hail Mary and The Our Father my prayers have slowed down. Sometimes even pausing with every word. I have also slowed down my three children as they pray their nightly prayers. Sarah says: "There's a new message for me each time I approach the Hail Mary slowly. A calmness is cultivated that forces me to live in the present moment in a way so few things in my modern life of gadgets and responsibilities require." I am finding this also as I slow my prayers down, and this book has been a great tool for that. Finally She states: "We'll take a journey together through the Hail Mary, word by word. The prayer will expand as we work our way from Hail to Amen. You may find yourself uncomfortable, inspired, confused, or even overwhelmed. Embrace that experience and let Mary guide you to her Son through it." So come along see what else really hit me from the book and hopefully from these samples you will find that deeper connection to Mary and through her to the Father, the Son and the Holy Spirit. Carol Ann Chybowski in the first chapter on 'of' asks us to reflect on these questions: "As you pray, ask yourself: What am I of? Where do I come from? And to whom do I belong?" Do you relflect upon these questions. Jennifer Fitz in her chapter on 'women' stated "And if some of us women are called to biological motherhood-the business of bringing forth newly created bodies and souls-all of us are called to spiritual motherhood. Grandmother, aunt, sister, daughter, colleague-whatever our title, we have a lifelong mission. An eternal mission, as the intercession of the saintly women in heaven attests." To me this was one of the most powerful passages in the book. I have shared it with a few friends and family and all the women I shared it with were touched. Later in the book it says "As Catholics, we have been raised to understand Mary in that endearing way. We embrace her not only because of the important role she played but also because we know she can sympathize with our family problems." Michelle Buckman in penning these words might know how many mothers and fathers these words will impact but they have greatly impacted me. Recalling a story Donna-Marie Cooper O'Boyle says this "Blessed Mother Teresa of Calcutta, whom I knew personally for about ten years, had a very close relationship with Mary and taught me a simple yet profound prayer that I pray often: "Mary, Mother of Jesus, be a Mother to me now." Mother Teresa stressed that Mother Mary wants to mother us sinners and wants us to call upon her often. She wants to be our Mother. Mary, Mother of Jesus, be a Mother to me now!" This chapter on 'sinners' was amazing and what I really needed to read that day. "The Hail Mary is a beautiful and powerful prayer. In the first part, we recite the words of the archangel Gabriel and then those of Elizabeth. In the second part, we ask Mary to pray for us. And to pray for us now." Ellen Gable Hrkach in her chapter on 'now' pens these words. How many of us pray in the now, or even live in the now. This was one of my favorite chapters in the book. (Not that there was a bad one, but some impacted me more now than others.) Ellen goes on and later says "Now is a good time to take stock in our spiritual life. Now is a good time to take care of our bodies, our minds, and, most importantly, our souls." Will you do so? Susie Lloyd in her chapters on the last 'the' uses a number of examples from Winnie the Pooh I am looking forward to reading her chapter with my children and seeing if they get it. It is a splendid little chapter. Fr. Patrick Toner writing on 'amen' says: "The Church teaches lex orandi lex credendi, or "what you pray is what you believe." The Amen at the end of any prayer is like signing your name to the Declaration of Independence: you've put your life on the line. Live all of your Amens." What do you believe, what do you pray, how do you pray? This book was wonderful. Unlike most books I read it slowly over a few weeks and have already gone back and started it again. It is an excellent read and I highly recommend it! It has been a long time since someone bought me a book not on a wish list. If they all end up being as good as this one I might start asking for surprise books. That is what this book was a complete surprise. My wife bought it and give it to me in the car on the way out of town, I had read almost 100 pages before we got to our destination. It has been a few days now since I finished reading it and I cannot stop thinking about the story and the characters. This story is told in many parts, and is really many stories that come together like streams then flow apart again. 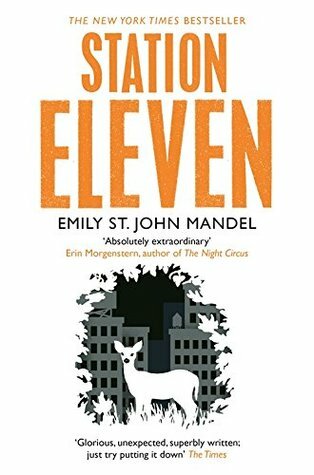 The main part of the story is set in year 20, that is 20 years after the Georgia Flu wipes out an estimated 99% of the world's population in a very short time. Because of the lack of manpower, within days services start failing. Water, hydro, the internet all stop working. Civilization has crumbled. The Travelling Symphony work a territory traveling and putting on Shakespeare plays and performing concerts. One of the towns they have frequented is 'under new management' and their fortunes have taken a turn for the worse. The story is told back and forth across time. Sometimes stories pre collapse, and sometimes people remembering stuff pre year 20. The main stories follow some key characters, world famous actor Arthur Leadner, Jeevan a paramedic in training the night the flu hits who tries to save Arthur on stage in Toronto. 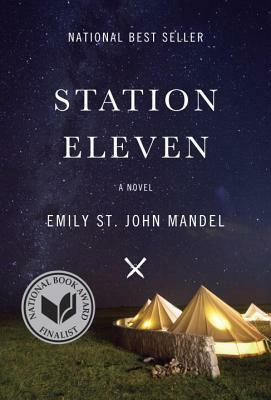 Miranda who was Arthur's first wife and the author of the graphic novels Station Eleven, Clark, who is Arthur's oldest friend and Kristen who is with the Traveling Symphony, and in the time before as a child was on stage with Arthur, and the strange 'prophet' of the light. This story is amazing on a few levels, first it is a post-apocalyptic story that showcases lives, before during and after the collapse of all we know. Second the characters are wonderfully written. Years ago I head Madeleine L'Engle speak and she mentioned that her characters were alive and real to her, and often she got insights to what they were up to now. I wish we could know some of that for these characters, where are they in year 25, what are they up to, what successes and what failures have they faced. I keep thinking about them and their world and wondering what happens next. That is a sign of a great fiction novel, it entertains, it makes you think, and you keep coming back to it. A few years back Emily's earlier book The Singer's Gun ended up in my to be read pile and I just never seemed to get around to it. That was my loss. 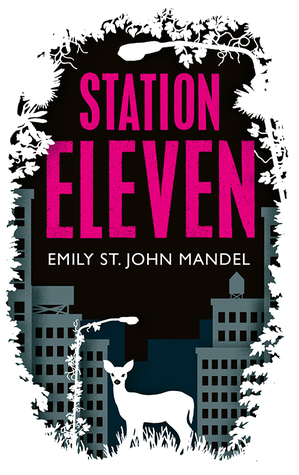 With how much I enjoyed this book I know I will be reading Emily's three other novels soon! This book was a thrilling read and I highly recommend it! Books like this have been around for years, and one of the most popular for a long time was Life's Little Instruction Book by H. Jackson Brown but what makes this volume so amazing is the clearly Christian focus, and the humility in some of the promises. My only real regret is that there is not an ebook version available so I could always have a copy with me to read 1 or 2 a day as reminders. #15 "I will try and listen attentively even when I don't really feel like it." #42 "I will choose to forgo some of my interests, allowing more time for you and our family." #85 "I will try to explain why I say no." #113 "I will teach you that in many matters you must be different." #172 "I will pray for the virtues; wisdom, fortitude, patience." This was a wonderful little book. I have read through it three times now. And know it will be a companion for yours to come. 1. Self-analysis. People of success know themselves. 2. Health. You don't have to be a fitness fanatic to be successful. But you can do much more in every aspect of life if you take proper care of your body. 3. Habits mastery. It is extremely hard to find a successful person who doesn't use consistent habits to achieve more. 4. Focus. Vision. Goal setting. This topic can stray into the intangible, but I'll keep it down-to-earth. 5. Socializing for business. Networking. It's hard to find a rich hermit. 6. Reading and self-education. How to get ahead of the knowledge curve and stay there. The Kindle edition comes in at 60 pages and man does Michal cram a lot of content in such a small space! Each chapter has the main teaching and then a quick point summary of the key items to remember or to think about implementing. As usual Michal teaches from his own experience and observations. In the introduction he states "Finally, I realized the broader picture: success is directly dependent on your ability to examine yourself." And what an example his own story is. Later he declares "My attention to self-analysis isn't the sole reason I gained these successes. Self-analysis is only one element in a set of success-building factors. But it's a necessary one." And it is the first one because The next steps will build upon the knowledge gained working through this process. Michal quoting book one says "I said it in the introduction to this series: success is not wealth or one-time achievement; it is process and small disciplines." And true to his work any success worth having will take work. Later in the book he states: "Because you are your greatest asset. Your success depends wholly on you. You can face obstacles, but armed with your internal resourcefulness you can overcome them. You may get lucky, but if you screw things up it won't do you any good. Your attitude and reactions determine your actions and the results you get." We must work at what we want, we must take ownership or who we are and also who we are becoming. Michal highly recommends tracking your goals, and he lives it. Currently on coach.me he has over 22609 check-in's. In the fourth chapter he says "The easiest way to become aware about the performance of anything is to track it. To progress in any given area, simply begin to track the essential metrics. You don't have to decide that you'll be mindful about it. Once you start tracking, you'll put your attention into it, and it will happen automatically. Focus and results are just natural aftereffects." And he goes on to say: "So pick whatever you want and attach some metric to this activity. I assure you that your focus and awareness will naturally increase in that area." But he highly stresses that the tracking must be easier than the habit itself or you will not keep up with the tracking or in many instances the habit because of lack of tracking. He emphasises "My suggestion is to start slowly and gradually. Expand your tracking activities in both scope and detail according to your progress." And I agree. When I started with coach.me I had a few goals, I now have a few dozen with some, daily, weekly, monthly and even quarterly - all starting with simple advice from Michal months ago. Your brain avoids self-analysis to keep you dormant. The results of self-knowledge are purposefulness, resoluteness, single?mindedness, strength of will, strength of character, firmness, intentness, and decision?making. Both of the stuck with me for days after reading the book. The final point that really hit me was when he stated: "But remember, knowledge alone counts for nothing; implementation alone holds the secret to success." For much of my life I collected knowledge and it has only been the last number of years I have really focused on applying what I know. Michal's books are helping me to do that. Michal's writings remind me often of John C. Maxwell, or Stephen Cover or Dan Millman. He gives great advice, but it is almost all from stuff he has learned from trial and error. His books give us great tools in small packages. I highly recommend this book and look forward to the next in the series and am sure you could get a great deal out of reading it also! This was the 11th book by Michal I have read this year, well actually the 8th book but I have read a few of them twice because they were so good. This book really packs a lot of punch into 35 pages. 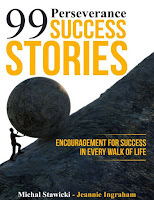 It is intended as an intro and overview of Michal's steps to success in any area of your life. And over the next 6 books in the series he will take us much deeper into each topic. This volume give some great advice and tips. 1. Do you believe success is in your hands? What is success, for you? 2. What will success mean if you achieve it? 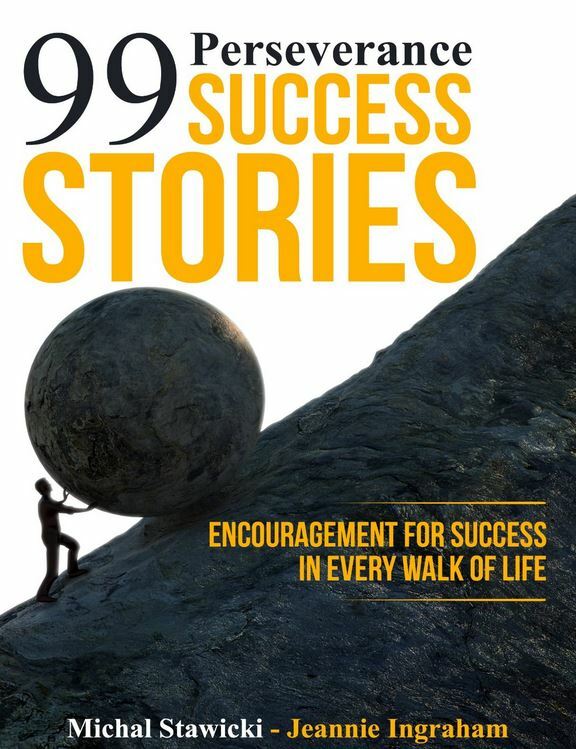 In the first chapter Michal quotes Calvin Coolidge "Nothing in this world can take the place of persistence. Talent will not; nothing is more common than unsuccessful people with talent. Genius will not; unrewarded genius is almost a proverb. Education will not; the world is full of educated failures. Persistence and determination alone are omnipotent." And that advice rings true. 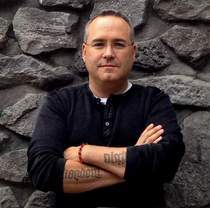 Michal has lived it in his life and his books help give us tools to pursue our own dreams and goals. Later in the chapter he quotes Ray Kroc "Luck is a dividend of sweat. The more you sweat, the luckier you get." Success will not come to most without hard work and persistence. Michal stresses that fact and does not sugar coat it. This is not a quick fix this is a tried and tested process and it is work! Quoting Earl Nightingale "Success is the progressive realization of a worthy goal or ideal." Michal asks "What kind of success do you want? The first thing to understand is this: You define your own success, so think about what it is for you. What do you yearn to be? A writer, a space rocket pilot; perhaps an entrepreneur or a great parent?" So knowing what you want you need to know what motivates you, he states "The meaning of success, for you must come from your heart. If it doesn't, you won't find the strength to pursue it. Your willpower will drain fast. You need a compelling reason to steadily pursue success. Reflect. What is your compelling reason?" I think the greatest single piece of advice from Michal in this book is "doesn't, you won't find the strength to pursue it. Your willpower will drain fast. You need a compelling reason to steadily pursue success. Reflect. What is your compelling reason?" Anything work having will take hard work. Michal does not water down that truth with platitudes. Later he states "Success is not grand. Success is not massive. And that's cool, I think." True success is the result of lots and lots of work, dedication, persistence and Michal reinforces that truth. Michal then goes on to state: "This book series is the 'back way in' to success. I believe that when you have a degree of mastery in each of these six tangible areas (common to most achievers), you will also be enjoying life!" He is guiding us with his own life as an example. This was another amazing book by Michal Stawicki. I highly recommend it and really look forward to the rest in the series! Give it a try and you will not be disappointed.